Sonos offers limited time discount on wireless hi-fi system | What Hi-Fi? 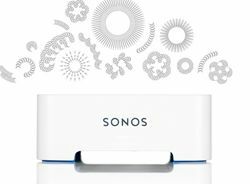 Sonos is offering a limited time offer, enabling you to get a free Sonos Bridge if you buy a Play:3 or Play:5. If you're thinking about expanding your Sonos system, or starting one, then now looks like the time. The Sonos Play:3 and the Play:5 are the two sizes of the wireless speaker system, offering three and five speaker drivers respectively. You can use them individually, in horizontal or vertical mode, or connect two together to use as a stereo pair. Both can connect wirelessly to your music system but with any Sonos system you need one device connected to your wireless router. The Bridge allows you to get around this – you connect the Bridge to your router and then every Sonos speaker can connect wirelessly. The Sonos Bridge usually costs £39 but is free with any Play:3 or Play:5 for a limited time. Sonos recently released brand new desktop clients for controlling your Sonos system, plus the Sonos Labs area of the system for testing out forthcoming services.